Today was a day all geared around getting Maebyn tired so this “stay at home dad” could peacefully enjoy the Michigan State vs. Indiana game. I planned out the whole day so she would be well rested , fed and ready for bed by around tip off. I had planned to let her watch the first ten minuets with me just so I could start prepping her for where her allegiances will fall. She only made it about five minuets in though.I thought, no biggie, cause she went down wearing Spartan green. Needless to say, the game didn’t end up the way I wanted it to(make your free throws MSU and we win the gam).Maebyn woke up with about 3 minuets left in the game so I spent the better half of the last two minuets trying to calm a crying baby and control my ever increasing emotions all at the same time. Thank goodness she can’t understand what I say yet because controlling my emotions when MSU should have won by 5 but ended up losing by 4 didn’t come easy, actually at all. I didn’t see the entire debacle though because I was making a bottle, changing a diaper, and looking for a passi. 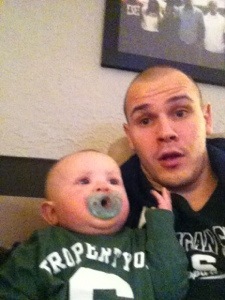 Oh, the joys of parenting… And being an MSU fan. Although we didn’t win it was fun watching the game with her. It will be fun passing down my love of MSU, The Tigers, and the ever embarrassing Lions to her. We may live in Ohio but one thing is for sure, she will be a MSU, Tigers, and Lions fan. She has no choice in the matter. I love the fact that as a parent you get to pass things on to your kids. I love sports and I can’t wait to share them with my kids. Whether they love sports or not we will be making memories for years to come in cheering on these teams, just because they are dads teams. Thank goodness Maebyn is to young to remember this game. I take solace in the fact that neither will MSU fans come March. So here’s to a deep tournament run in March and to passing on my love of Sparty to my kids. Maebyn’s fast asleep now, proudly clad in the Green and White, after watching the game with dad and that’s more important to me than a win. So I thought I’d try to write a more light-hearted post today but don’t be surprised if this gets a little sappy. It’s snowing in the ‘Nati today and you would think by the way the city acts we are getting a foot of snow. Don’t worry we are not, only less than an inch. We’re never that lucky here. For those who didn’t know, I was born and raised in Holland, Michigan. I’ve heard Holland described as a little slice of heaven, Gods favorite city in America, ect… You get the picture… I love Holland, MI. I know it seems crazy that someone that loves Michigan so much wouldn’t live there right? Well, I agree. If I had my choice I probably would be living in Michigan. In fact, in high school I think my friends said I was the least likely to go away from home to college, and I agreed. Thankfully, God had different plans for me and brought me to the city of Cincinnati (sometimes referred to as Suckinnati… Patent-pending on that word by me and my 6 year old pal, Miles Zimmerman). One things for sure, I know I am here for a purpose and am so thankful for the people God has placed in my life here in Cincinnati. I’m also grateful that God knows exactly what our heart needs and where it needs to be. I miss my family, friends, and the home state when it snows, but it all reminds me that I am not here by mere chance. Alright, me and the Maebs are off to the mall. 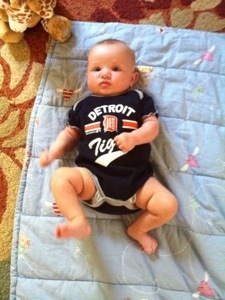 All this talk about Michigan has made me want to go buy something with the Detroit D on it and she couldn’t agree more.